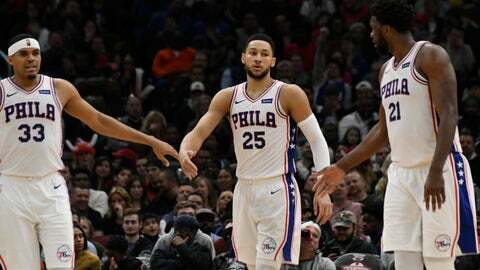 PHILADELPHIA (AP) — The 76ers‘ championship run rests on the condition of Joel Embiid’s achy left knee. “If I can’t go, it means it’s pretty painful,” Embiid said Friday. He’s doubtful on the injury report and he took another guess on social media Friday night with the caption “it’s that time of the year” and a slideshow of Embiid playing against Brooklyn, Toronto, Boston and the Golden State Warriors — a possible combination of teams that Sixers would have to beat in order to win their first NBA title since 1983. Embiid missed 14 of the final 24 games of the regular season and played just 64 this season. Even if he plays Saturday, he’s clearly in pain and his injury history offers no assurances his body can hold up over two grueling months and the possible 28 games needed to win a title.